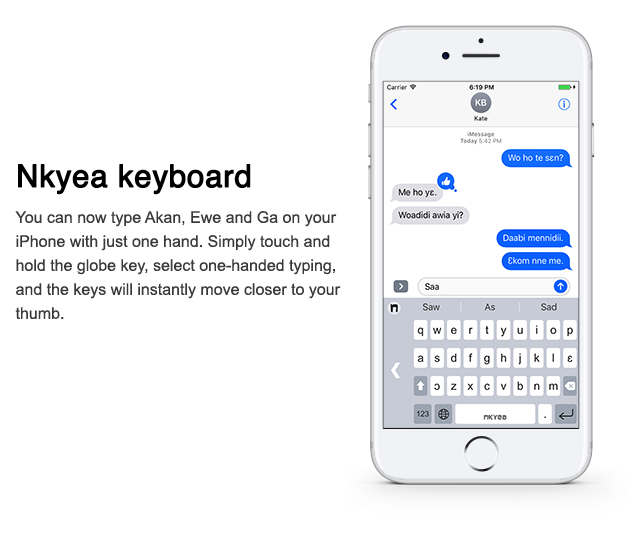 Today we have released Nkyea keyboard 3.1.0 making it easier to type Akan, Ewe and Ga on the go on your iPhone. Our new feature is similar to the standard iPhone keyboard’s upcoming one-handed typing mode, which when enabled, compresses the keyboard to one side of your screen so that you can better type with just one hand. The new one-handed keyboard mode can be activated by holding down the globe key in Nkyea keyboard. It can also be activated by choosing Keyboard position in the Settings section of the Nkyea keyboard main app. iPhones are continuing to get larger so a one-handed keyboard is a small touch that can go a long way in improving the experience of using the phone to type in Akan, Ewe or Ga. Learn more about Nkyea keyboard from here. Posted on June 15, 2017 by Nkyea.